We were graced with a visit by a pod of six bottlenose dolphin’s on Monday. These playful visitors wowed crowds on the Pier with a display of acrobatics and general swimming mastery! 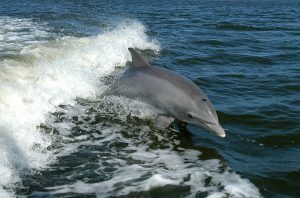 Bottle-nosed dolphins live in groups, they typically live in warm oceans and tropical seas. Although the warm waters of the North Atlantic Drift (or Gulf Stream a warm ocean current that comes from the Carribean area) warm teh waters of Cardigan and Llandudno Bay to such an extent that they can thrive. They can actually use tools and transmit cultural knowledge from generation to generation, and their considerable intelligence has driven interaction with humans.